Ten months after a structural failure halted construction on the downtown library, elected officials and civic leaders are increasingly frustrated by the lack of progress over a resolution that would enable work to resume. While attorneys for the city-parish and the various design, engineering and construction firms involved in the project have been busy pointing fingers at one another in 19th Judicial District Court, they have yet to agree on who should front the money—now estimated to be $2 million—to begin repairs and get the long-delayed project underway again. Downtown Development District Executive Director Davis Rhorer is also getting antsy as the months tick by. 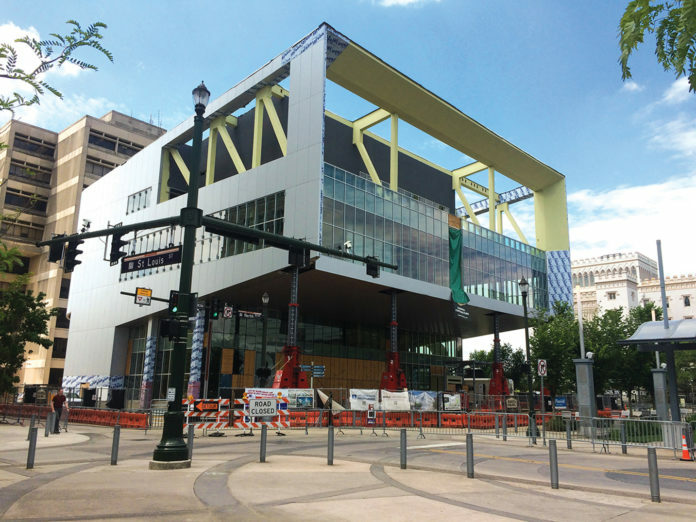 He describes the library as the centerpiece of North Boulevard Town Square, which he has worked for years to help create, and a key civic attraction in the heart of downtown. Earlier this year, it appeared the library board, with city-parish approval, was poised to front the money for the repairs and construction, provided it would be reimbursed once the litigation was settled. But that deal was negotiated under the Parish Attorney’s Office, which is no longer representing the city-parish in the case. An attorney with the private law firm that took over the matter says they are still trying to work things out. Wicker says that’s not soon enough and that the lawyers need to figure things out.